MOHALI: England captain Alastair Cook is looking forward to a rare week-long break in a hectic playing schedule after the heavy third Test defeat against India in Mohali. Virat Kohli’s side won by eight wickets to take an unassailable 2-0 lead in the five-Test series. But England’s players are looking to unwind with some welcome down time in Dubai before making the short trip from the Gulf resort city to Mumbai for the fourth Test, which begins on December 8. 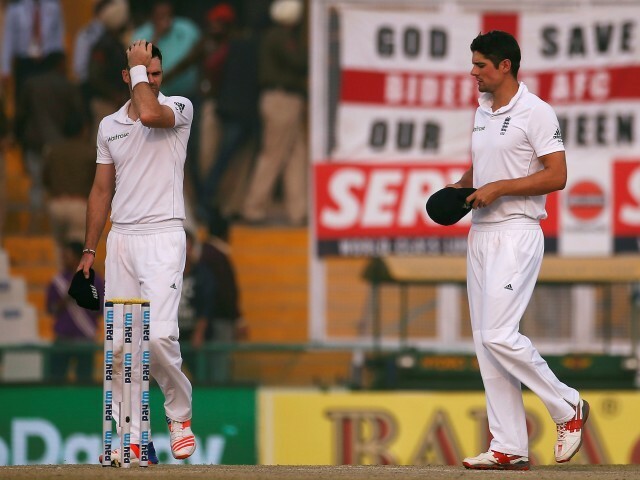 “The break comes at a very good time, obviously, after three back-to-back Test matches,” Cook told reporters after the defeat. Some of the England squad have been on duty since landing in Bangladesh on September 30 for three ODIs followed by the 1-1 draw in the Test series there. India captain Virat Kohli has moved up to a career-best third spot in the latest ICC Player Rankings for Test Batsmen. The 28-year-old Kohli scored 62 and six not out in Mohali to move to 833 points, within 14 points of England’s Joe Root in a list led by Australia captain Steve Smith. Starting the series in 15th position, Kohli has risen at a fast pace, scoring 405 runs in the three Tests. Kohli, who is top-ranked in T20Is and second in ODIs, looks determined to top the table in Tests, the only format in which he has never been top-ranked. The remaining two Tests provide more opportunity to Kohli. Published in The Express Tribune, December 1st, 2016.